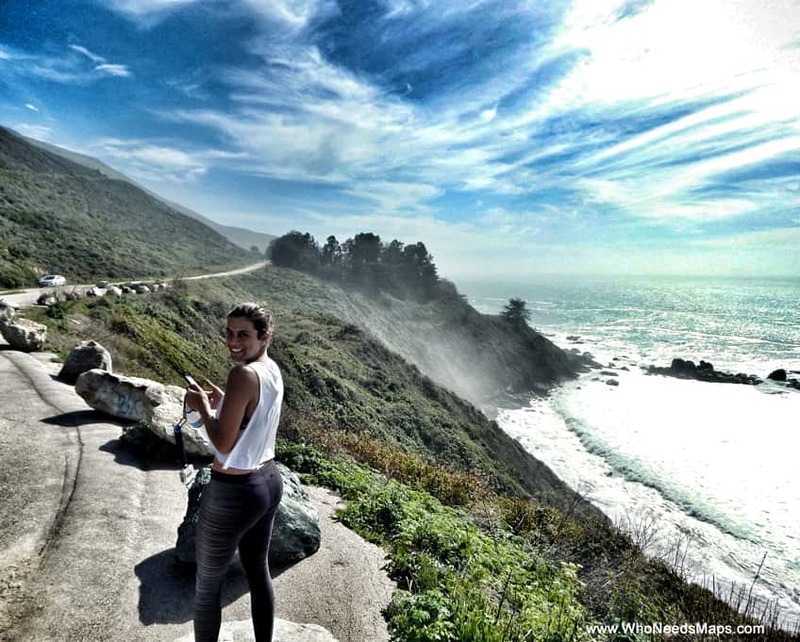 Big Sur is easily one of our favorite road trips from LA! It’s about 300 miles from LA (and 150 south of San Francisco) along the famous scenic One Highway. 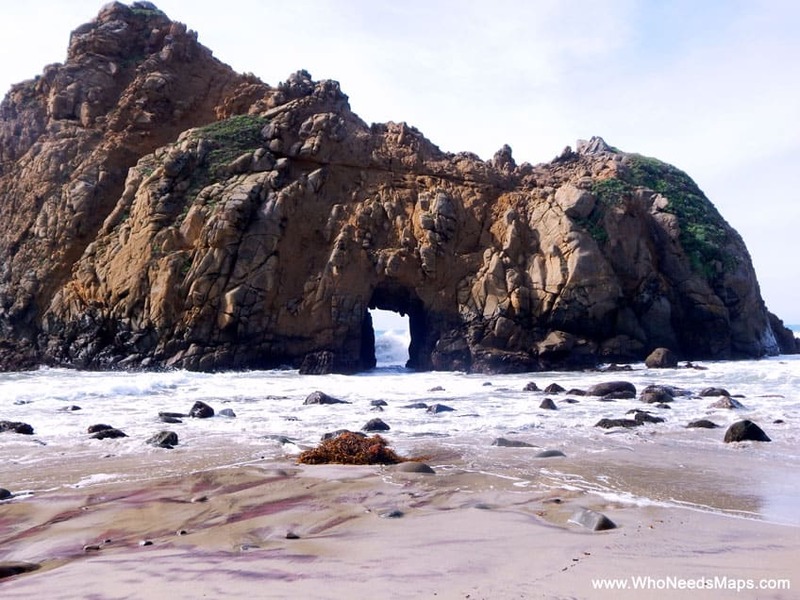 It is one of most amazing coastlines and wild hikes California has to offer. 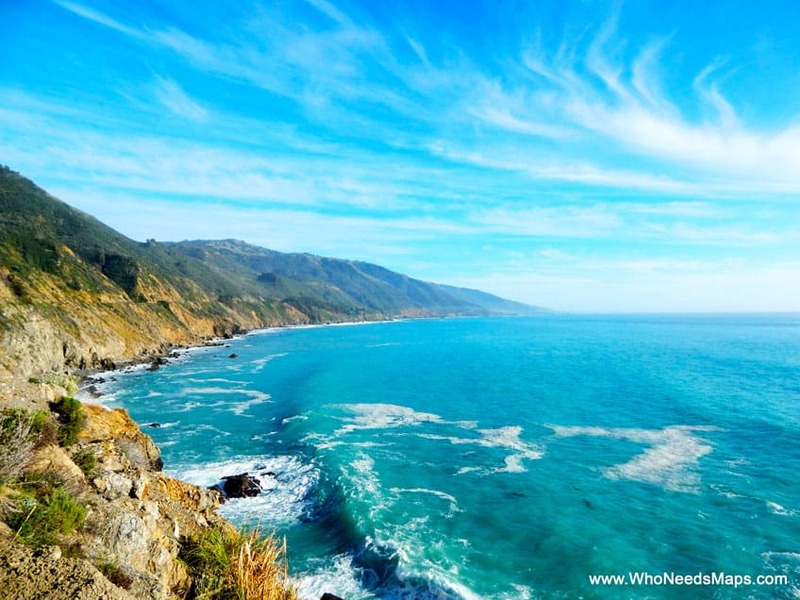 Apart from the unsurpassed natural beauty from driving along the coast, Big Sur has many places to stop along the way! 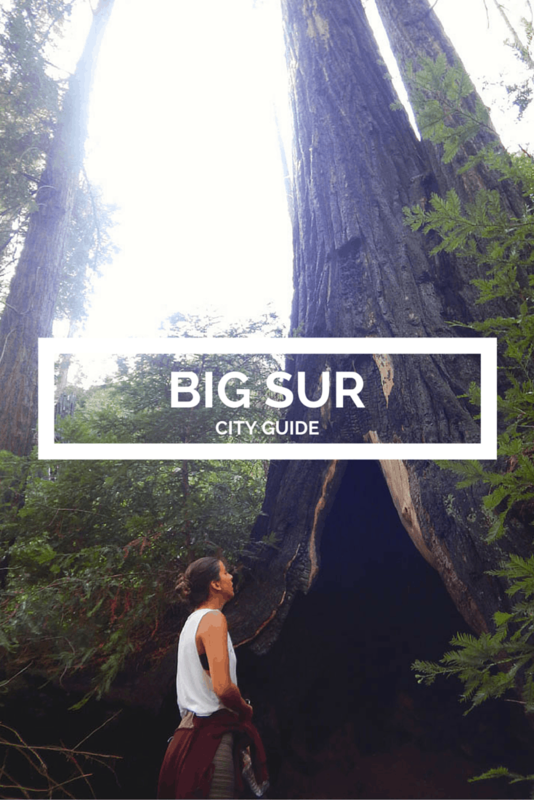 Here is a complete Big Sur City Guide! Obviously, one of the best parts of Big Sur is the amazing coastal drives. There are plenty of viewpoints and vistas to pull over and bask the impressive coastlines. We stopped nearly every 20 minutes because the view was just that breathtaking. 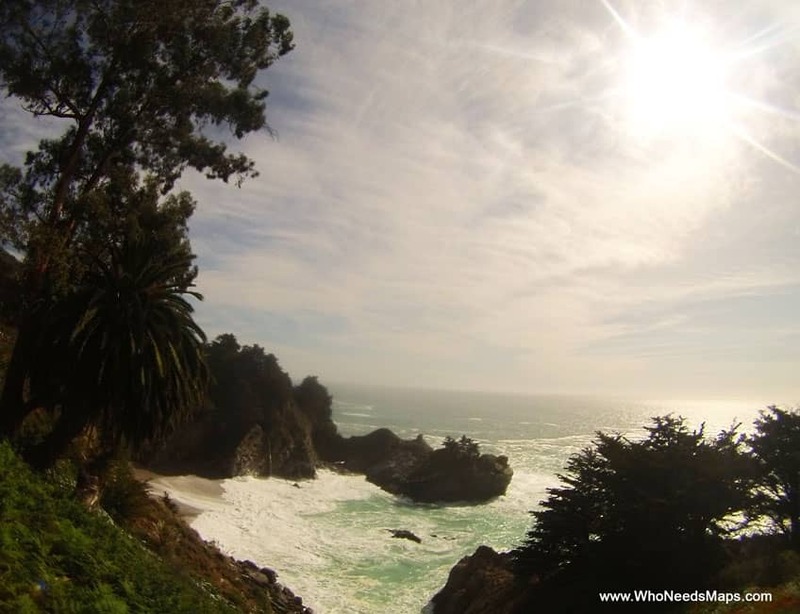 Pfeiffer State Park is the typical image you see with the sunset peaking through the rock amongst the ocean when googling Big Sur. 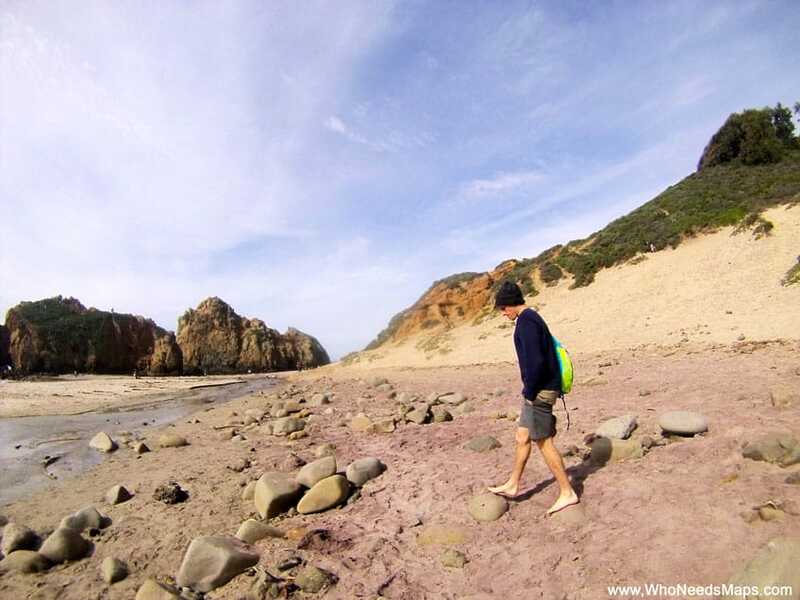 Although the beach and rock formations are impressive, the coolest part of this national park was the purple sand beach. Yes. 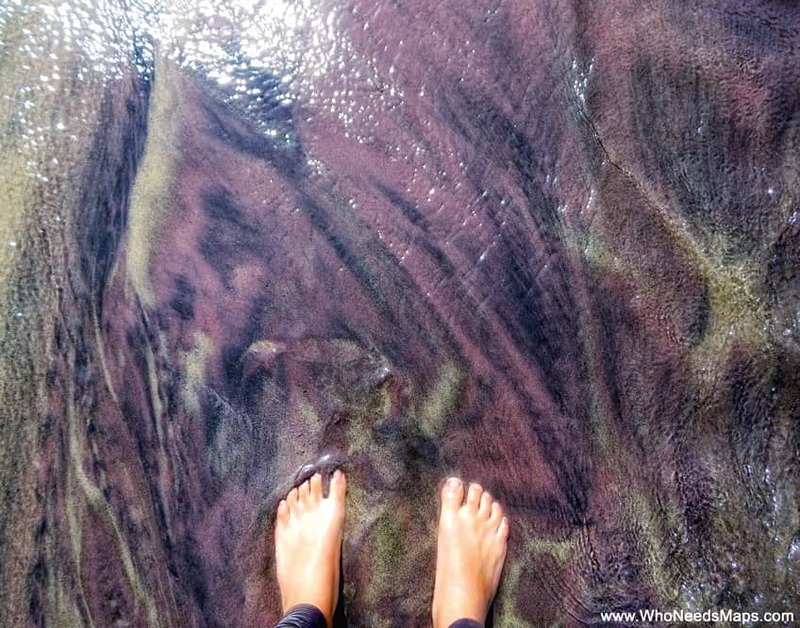 PURPLE sand! 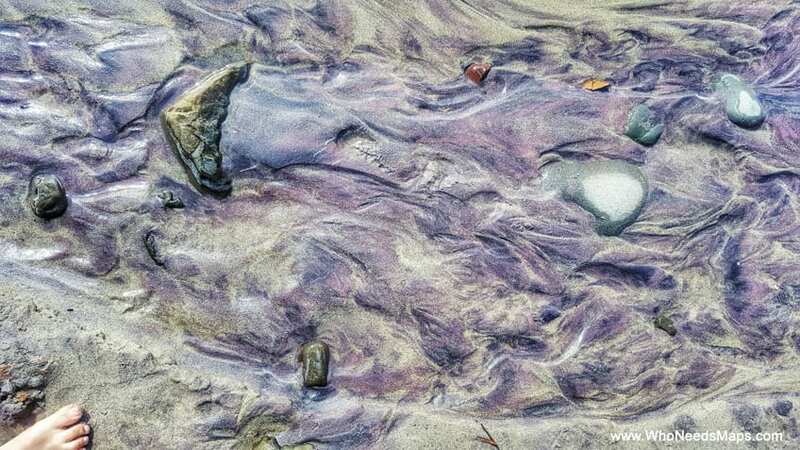 The sand was a marbled purple and when wet, it glistened. I don’t think I’ve ever seen anything like it! It is truly a spectacular site! Jack and I have never laughed so hard until we visited this beach. 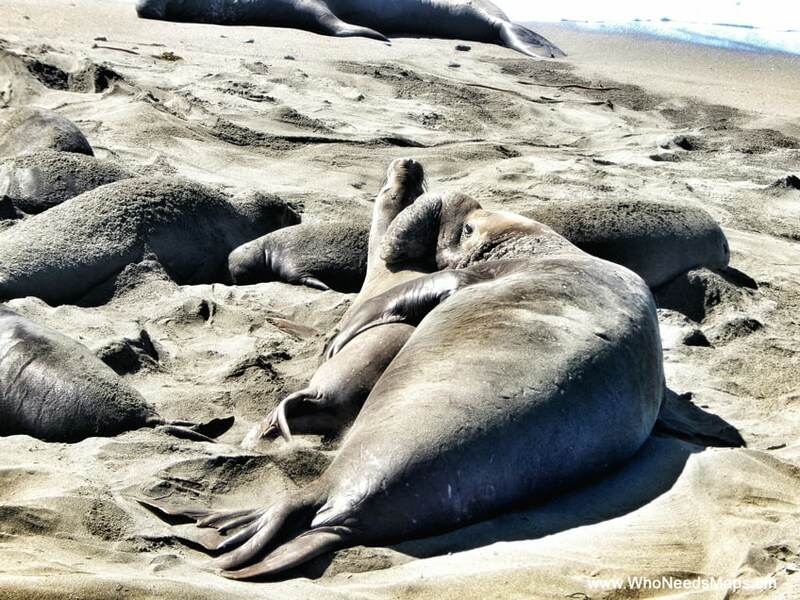 There are HUNDREDS of these elephant seals/seals along the beach. The smaller ones are female and the larger ones (the ones with the larger nose? Not sure if that’s the right term) are males. These seals make a horrifying sound- it could be a mating call, it could be that they’re too hot, it could be that they’re hungry but we could not stop laughing when they made these sounds. It was also mating season, and that was a bit disturbing. If you want a good laugh, I wouldn’t miss Elephant seal beach (we even went back a second time). 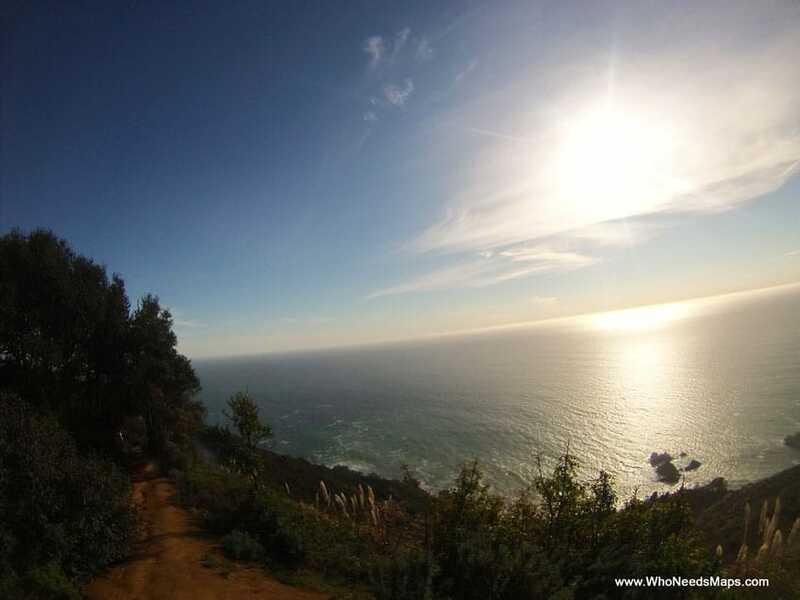 Big Sur has some of the most beautiful hikes we have seen. We tried to do one each day while we were there and despite my complaints and sore legs, it was so worth it. We did Julia Pfeiffer Burns National Park (3 miles), McWay Falls (which really wasn’t a hike, rather a cool spot — like .5 miles), and Limekiln Park (3 miles). Hiking is one of our favorite ways to stay active while traveling. Hey, the more you hike, the more wine and cheese you can have! Limekiln was our favorite. There were waterfalls, streams flowing throughout the hike, and a bit of adventure requiring us to cross the streams using logs. 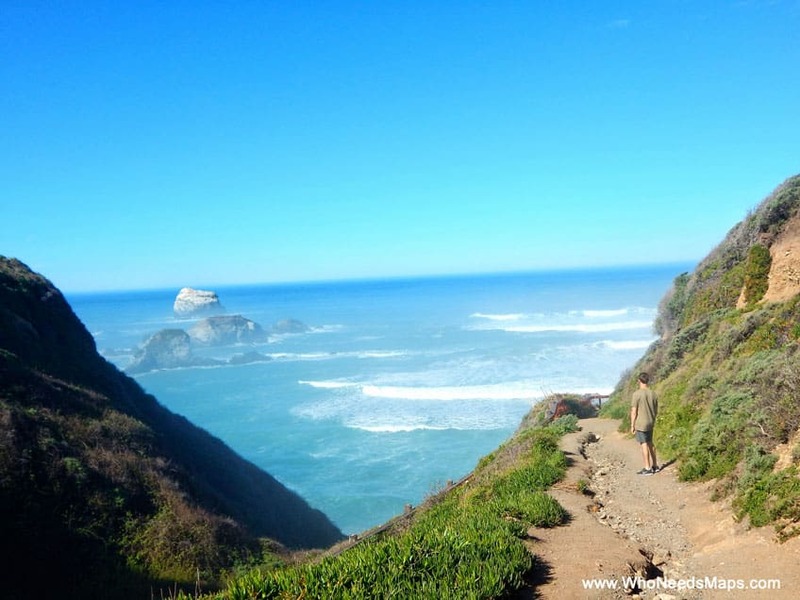 Other notable hikes are Salmon Creek Trail (6.5 miles), Ewoldsen Trail (4.5 miles), Andrew Molera Loop (8.8 miles), and Sand Dollar Beach (.8 mile). 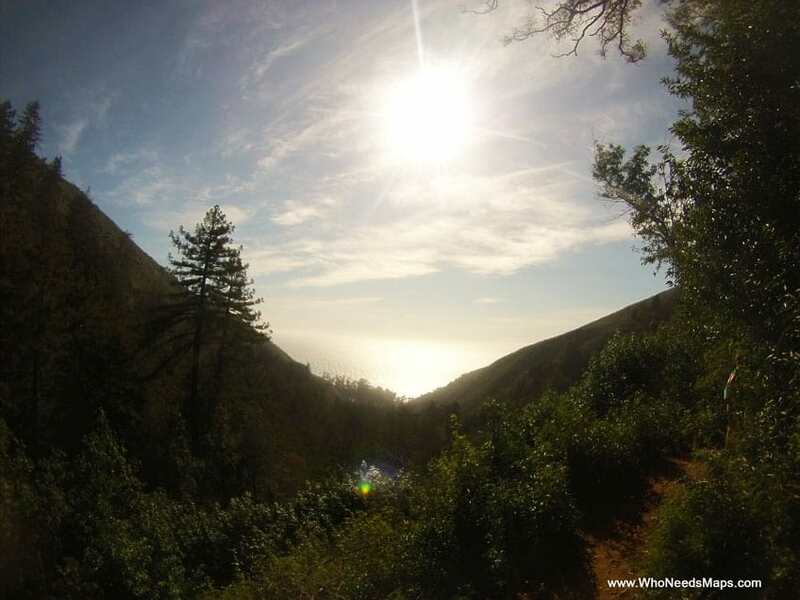 Do not go to Big Sur if you are not going to hike, you will miss out. 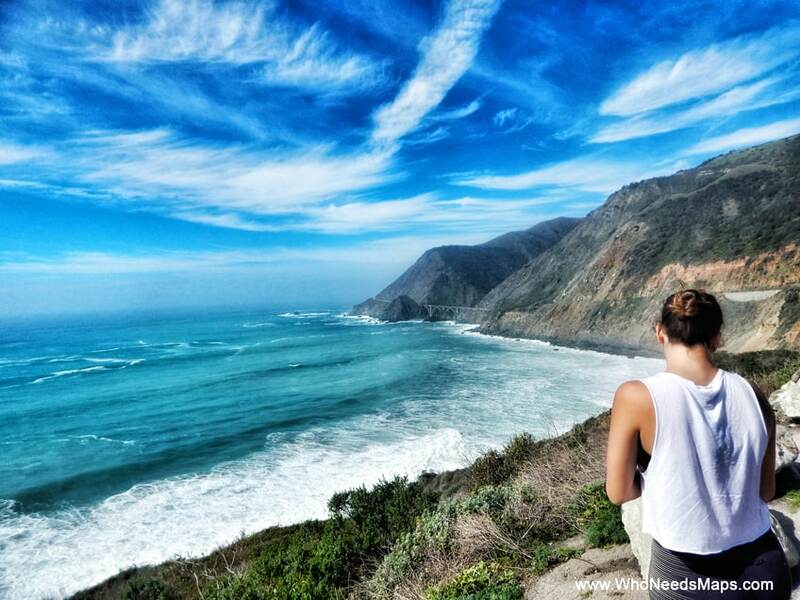 Hiking was a huge reason why we loved Big Sur! FREE Checklist Download: Get the essential medical kit packing list we wish we had when things went wrong on our travels! Our view from the Julia Burns National Park hike! 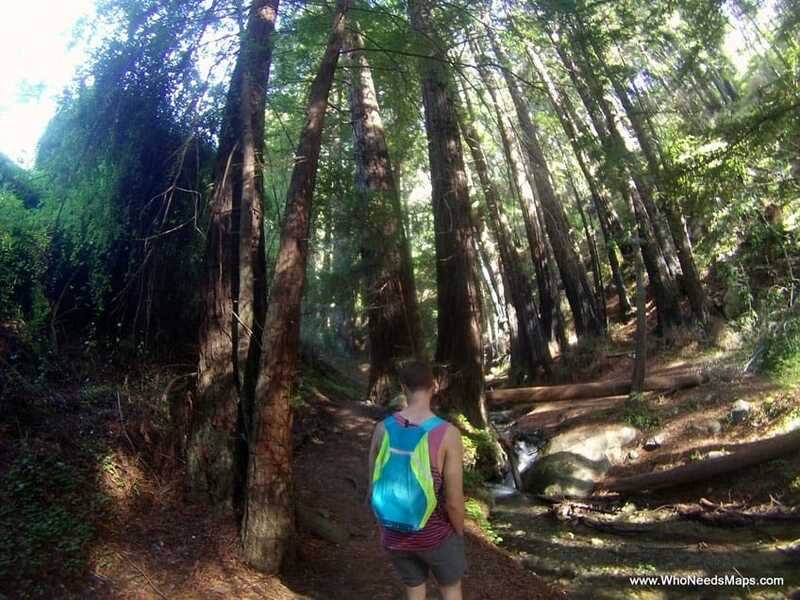 Limekiln was our favorite hike! It had some amazing waterfalls and water creeks running through the whole hike. 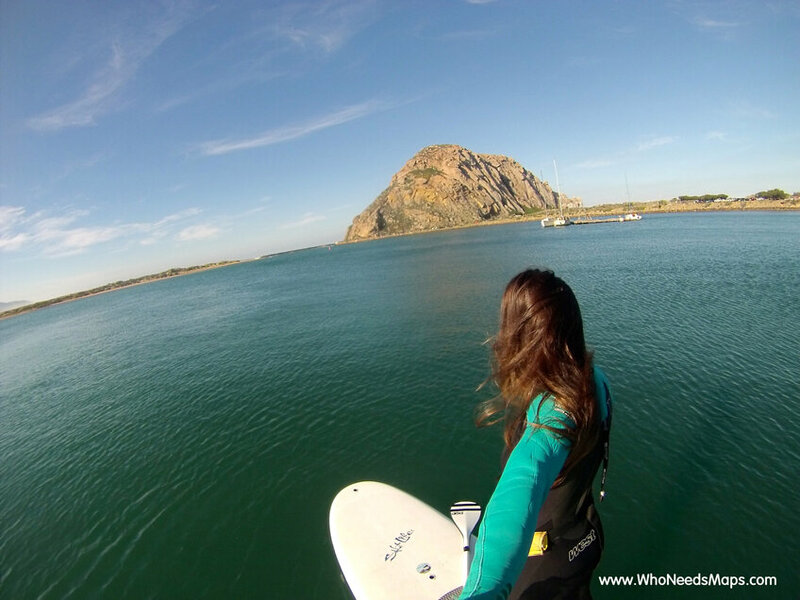 Both Jack and I have never paddle boarded, so on our way to Big Sur, we stopped at Morro Bay (you know, the place famous for the big rock?). 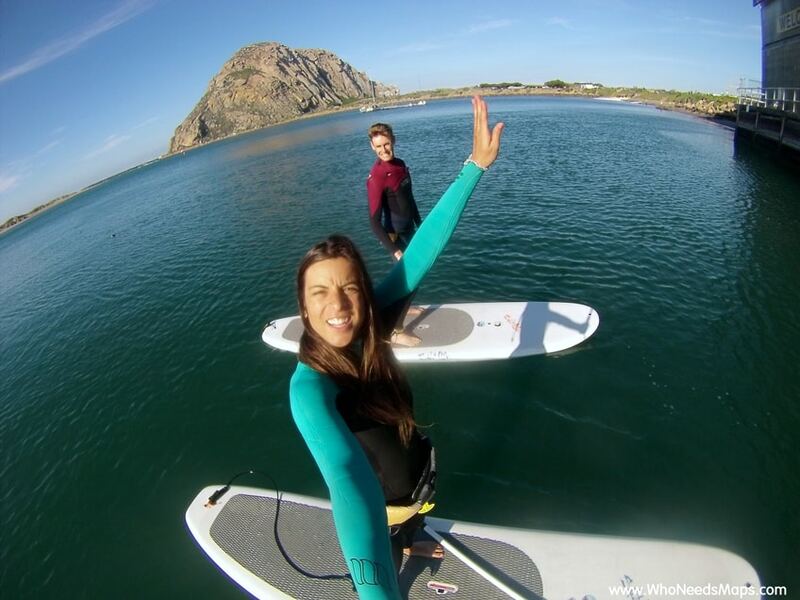 Well, we got to learn how to paddle board with an awesome scenery. There were seals, otters (yes, the cutest things! ), and event sting rays! It was a perfect place to learn! Since it was Jack’s birthday, I wanted to do something really special for him. 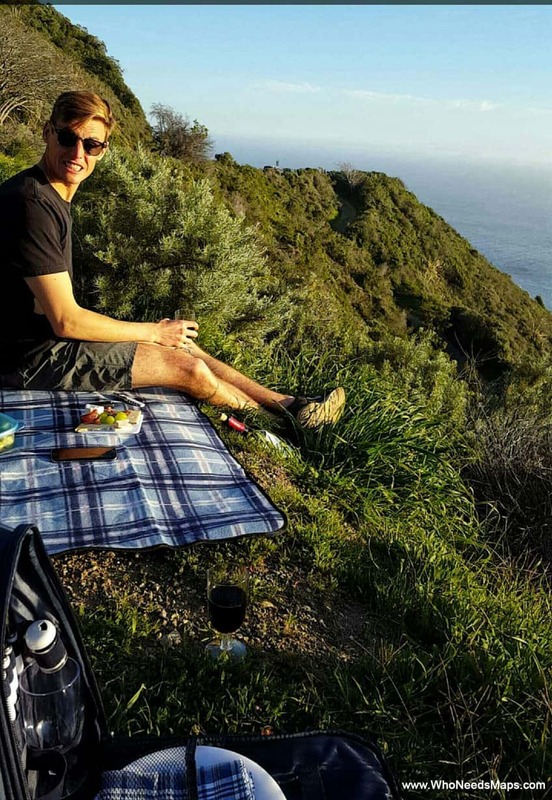 I bought some wine, cheese, and charcuterie and blind folded him at sunset, found an amazing vista point, and whipped out a picnic blanket with all the goods! Yea, pulled out all the stops on this one. It was really a fantastic experience! 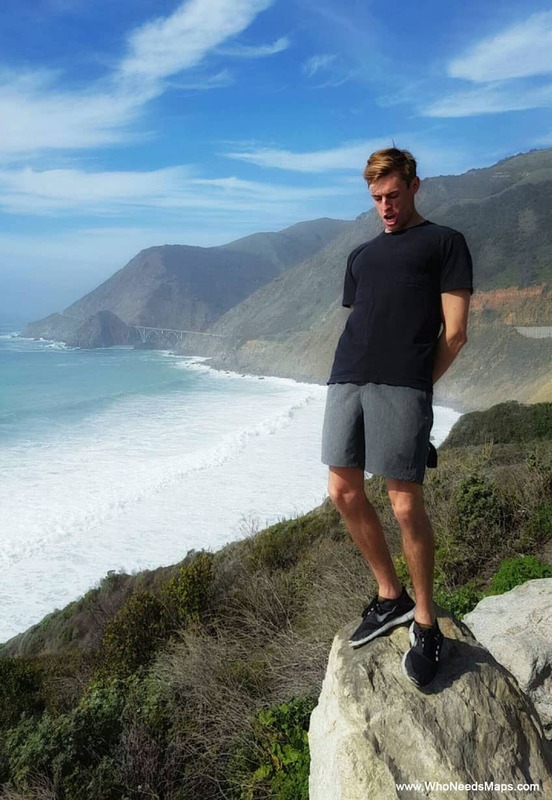 -Although you normally go to Big Sur to see the beautiful beaches, don’t let the pretty outdoors fool ya! As it is on the coastline, it gets a bit foggy and cold so don’t forget to bring a jacket. -But saying that, while we hiked the sun was out and it was strong so bring some sunscreen, get the spray. -Gas in Big Sur is INSANELY expensive. Like $6.7 a gallon expensive. If you have half a tank or less left, fill up at the big cities or before the 200 mile stretch of coastline. Plan it out. No one wants to pay $100 for gas (like we did). 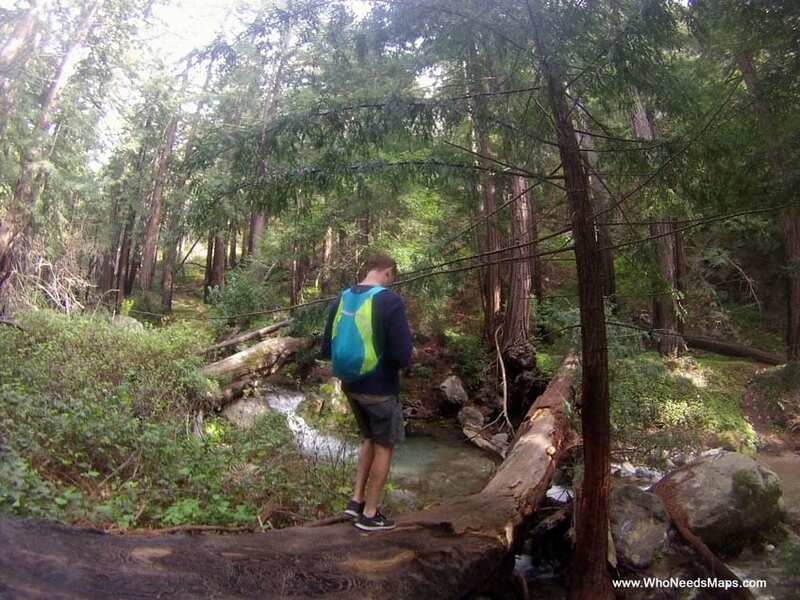 – We brought a lightweight backpack from LCI brands onto all our hikes to carry our gear and it was easily the best purchase! Lightweight, fluro (so I always could spot Jack), and surprisingly big and comfortable. It even folds up into a carrying pouch! 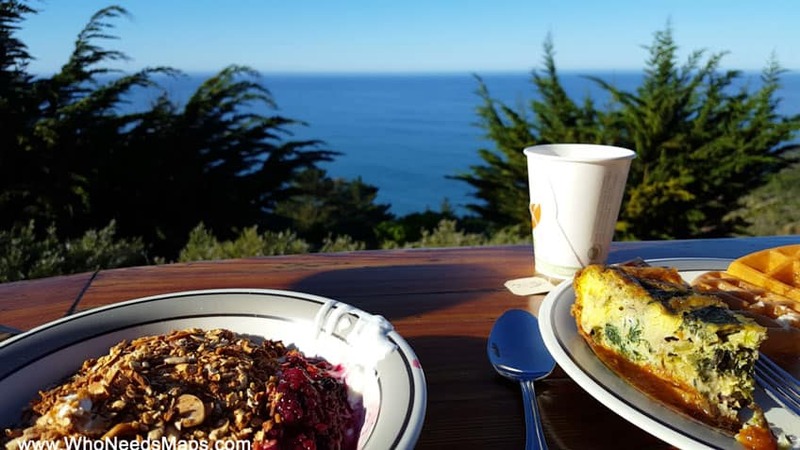 – Food is a bit pricey and underwhelming in Big Sur. Sure, you’ll find good food but we never found it to be worth it. So we packed ourselves some snacks, sandwiches, cheese, and wine! We thought that was the cheapest and tastiest way! -If you are not from here, there are a few car rental places in larger cities if visiting. We personally own a car but our friends said STA was the cheapest they found. If you are over 25 year old, you can get a great rate! 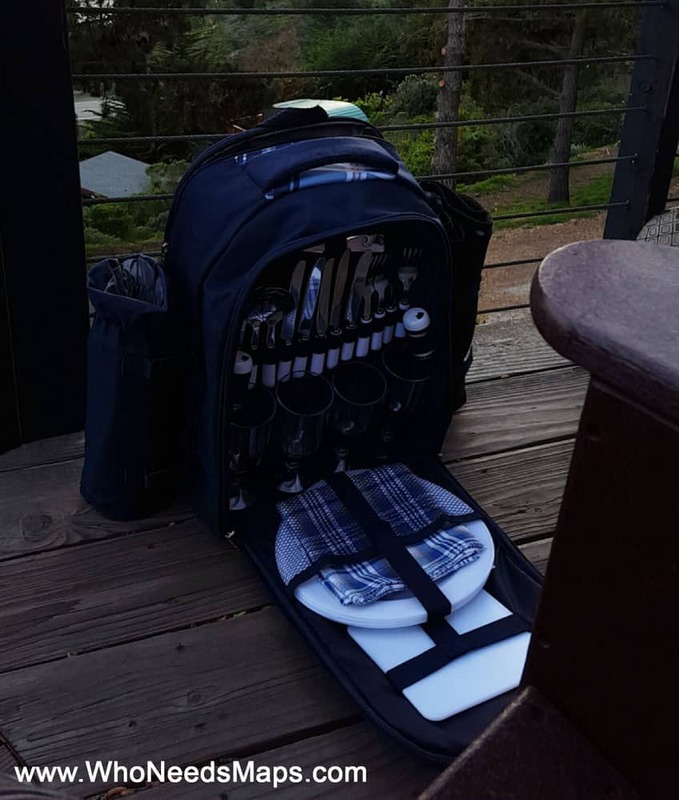 – I wanted to surprise Jack with something romantic, so I bought a picnic backpack, which included an insulator (for lots of wine), glasses, plates, cheese plate, cutlery, AND a picnic blanket! So we stopped by a vista and I pulled out the blanket, made a cheese plate, and some cheeky wine. BEST SURPRISE EVER! 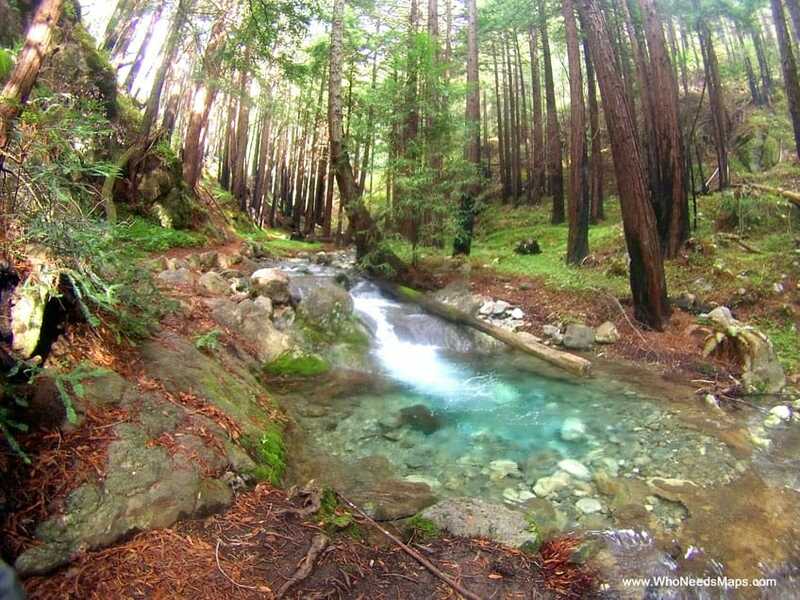 Big Sur Camping ground & Cabins – These are cabins and campgrounds that follow the Big Sur River and surrounded by Redwood trees. Most cabins include a fire place and kitchen and the campgrounds have a store, laundry facilities, activities (like basketball and tubing in the river!). Riverside Campground & Cabins – This campground offers tent camping, 12 cabins, and RV camps! 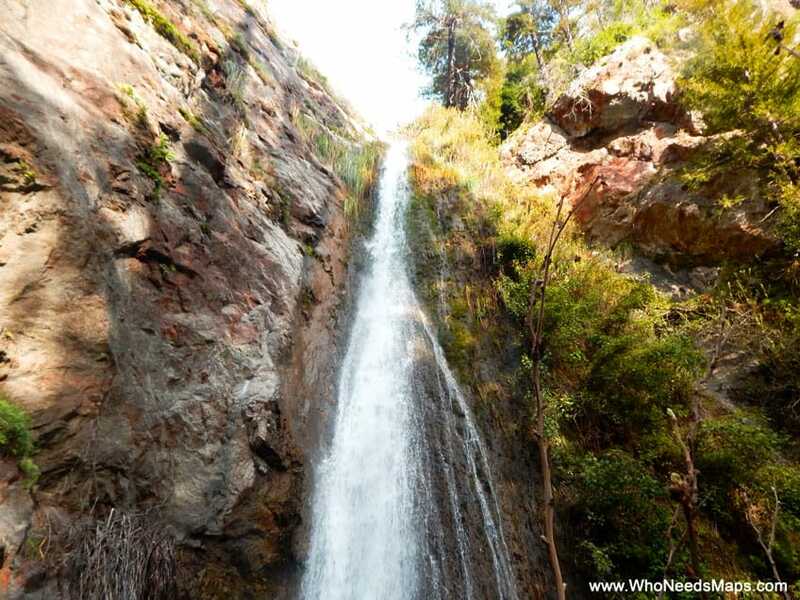 It is in a cozy location, in midst of the redwoods and along the Big Sur River. Hiking and beaches are just minutes away! Treebones – We also stayed here for a night for an extra special night to try GLAMPING! We stayed in a yurt that had a partial ocean view, but that was good enough for us! The ocean, the trees, the stars! Oh ban, It was an awesome experience and we highly recommend it. Just bring extra ear buds because sometimes it can get a bit loud with the wind. Plus, there is all you can eat breakfast!! Deetjens Big Sur Inn – Deetjens is a really rustic and quaint lodging option. 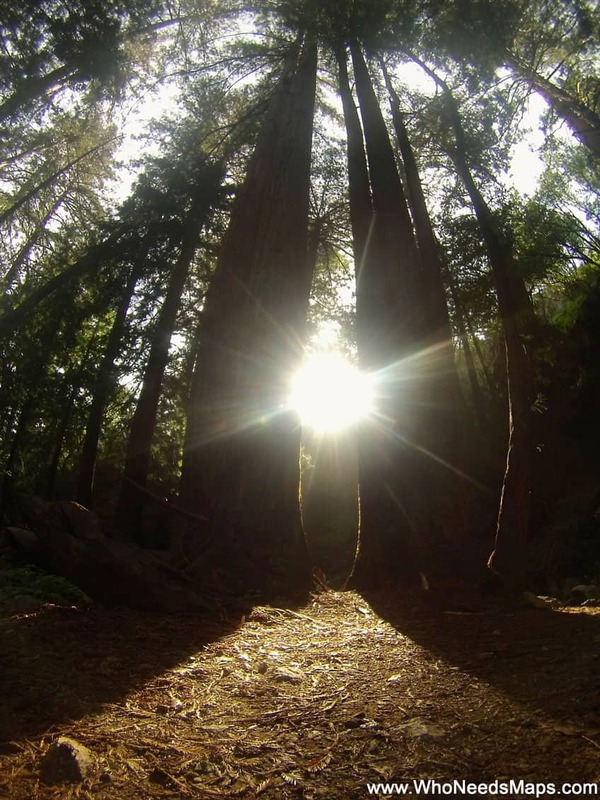 It is nestled in the Redwoods of Castro Canyon, making it a super peaceful setting. There are no luxurious amenities (like TV and internet access) but it is definitely a place for relaxation and a disconnect from technology! Post Ranch Inn – Post Ranch Inn is the most luxurious place to stay in Big Sur—the 5 star resort offers the best ocean views, your own private deck, spa tubs, and many other complimentaries! This is the perfect escape for a romantic getaway. The hotel has a beautiful landscape, a swimming pool, and soaking pools, with hiking trails near by, yoga, and stargazing! 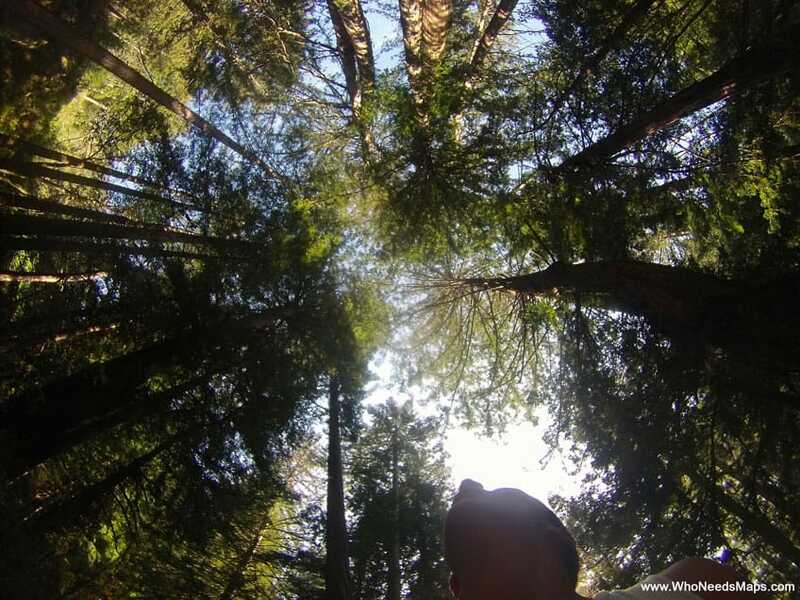 Glen Oaks Big Sur – We stayed here for one night for Jack’s birthday! It was so romantic, modern, and cozy. There was a delicious restaurant across the street that we went for dinner and free breakfast! You get your own private cabin, fireplace, and heated floors! Oh man, I woulda passed out on the floor for the night, it was nice and warm! Ventana Inn & Spa — If you are looking for something romantic with a killer view, Ventana is the place to be. The rooms overlook the dramatic Pacific coastline, providing you with ultimate serenity. Redwoods, fireplace, ocean views, hot baths and saunas, what more can you ask for?! 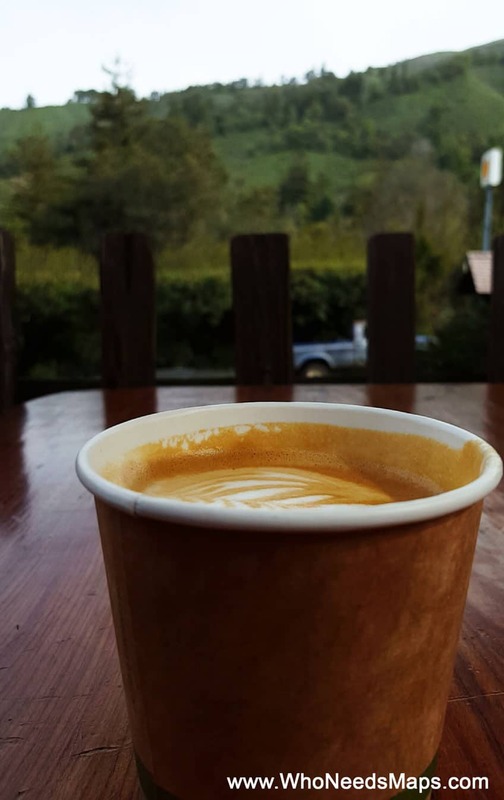 For a delicious (but INCREDIBLY expensive) coffee, Big Sur Bakery was awesome! It’s a cute little place tucked away in the hills of big Sur. They actually had a flat white on their menu, which made the Aussie very happy. We came here for our caffeine fix and for a midday snack. The lunch menu was great — we highly recommend getting the breakfast pizza! 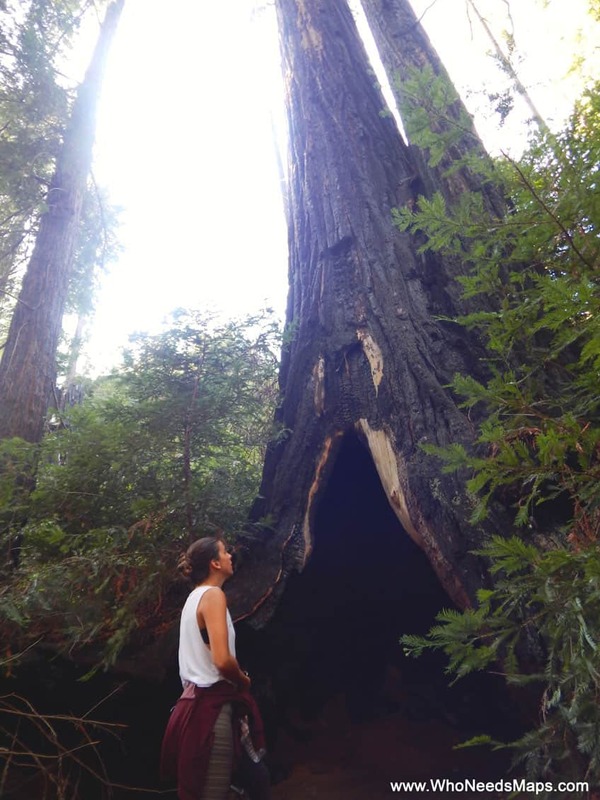 Have you been to Big Sur? What are your recommendations? Do stop at Nepenthe for a drink or fire in the evening. Stop at Deetjen’s Big Sur Inn for a meal, and if you wish, to stay overnight. There is a resident cat to pet. The rooms are fun. Awesome post! Your pics are really great! We haven’t traveled the US yet, but when we do, we’ll definitely do this road trip (and many others) :) It sounds and looks like a great trip! Happy travels!